Actress Haruka Ayase recently attended a press conference for her latest film project “Honno-ji Hotel”. Also starring veteran actor Shinichi Tsutsumi, the film will hit Japanese theaters on January 14th. 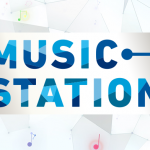 Taking place in Kyoto, Haruka Ayase plays the roll of “Mayuko” a woman who is standing at a crossroad in her life. She’s constantly thinking about the next step in her life, marriage to her boyfriend “Kyoichi” (played by (Hiroyuki Hirayama). Mayuko decides to spend some time at “Honno-ji Hotel”, located where the famous “Honno-ji Incident” took place, an event that ended in the death of the significant historical figure Oda Nobunaga. While staying in the hotel Mayuko finds herself transported back to 1582 where she meets Nobunaga (played by Shinichi Tsutsumi) in person who is right in the middle of his plans to unify Japan. 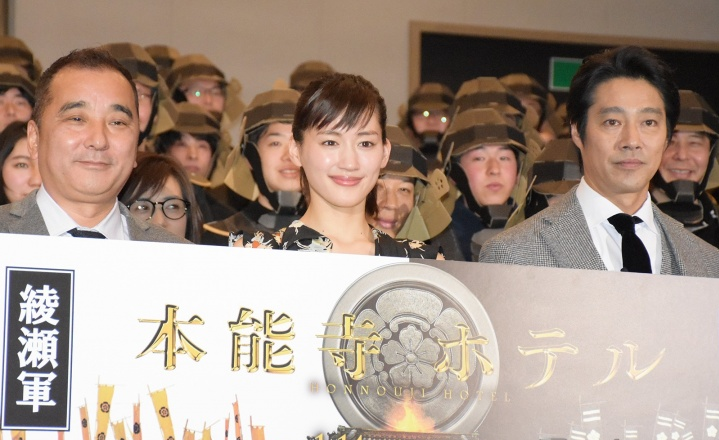 During the press conference Haruka showed off her gun handling skills and questionable drawing of a ninja, as well as successfully answering history questions regarding Nobunaga in a friendly competition with her co-star Shinichi Tsutumi. Haruku was full of smiles as she described how much of a great experience it was to do a project with past co-workers again. Haruka previously worked with Shinichi, Masayuki Suzuki (the director), and Tomoko Aizawa (screenwriter) on the 2011 film “Princess Toyotomi”. Pictures from the press conference, as well as a trailer for “Honno-ji Hotel” can be seen below.